US 50 E to Stateline Rd,left at Hidden Valley entrance,left on Alpine, home on the left.Sign on. Newly remodeled Ranch Home 4-5 BR,3 Full Bath is ready for it's new owners!Many updates-private setting in rear yard w/2 tiered decking.Two Master Suites.1st floor laundry.Att 24 x 20 Two car garage plus 36 x 14 Garage for RV/Boat! Workshop in garage 13 x 10. 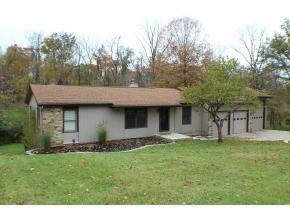 Wooded rear views-peaceful setting.Storage Shed.Like new interior! A Must See!